National Fire Pup Day on October 1 honors canine members of America’s fire departments. Dogs have historically worked, lived, and slept alongside members of local fire departments. Although most people only associate Dalmatians with firefighting, there are actually many different breeds that do this kind of thing. And they’re not just companion animals, either. Many of these pups actually work fires and their aftermath, participating in search-and-rescue missions. There’s a long, interesting history surrounding fire pups. Let’s take a look. ​As firefighting techniques became more modernized, fire departments began using Dalmatians and other fire pups as resident mascots. In addition to serving as companions, they guarded the firehouse and assisted with community outreach. When fire departments began utilizing horse-drawn fire carriages, Dalmatians remained alongside these contraptions since they proved to have a calming effect on the horses. ​Wealthy noblemen used so-called carriage or coach dogs to protect themselves and their possessions during long treks through bandit-infested territories. Dalmatians proved to be especially adept at this task. Fire stations sometimes take in dogs who have survived a fire — only to get left behind in the aftermath. You can adopt these dogs, usually during fire department benefits. There are a lot of ways to get involved with your local fire department, and educational initiatives are especially helpful. Find out how you can donate your time or money. Volunteer fire departments protect many communities across the U.S. If you think that might be a good fit for you, look into becoming one. Dogs have moved beyond being "carriage dogs" and firefighting mascots to actually helping investigators determine the cause of a fire. The super-sensitive noses of "acceleration detection canines" can sniff out evidence of arson. Dalmatians made great "carriage dogs" and firefighting companions since their unique look made them easy to spot during nighttime, smoke-filled situations. ​In 2012, a blind, deaf, three-legged Dachshund named True alerted its owner to a fire in their home. Everything was destroyed, but the family and True made it out alive. Animals have a long history of assisting humans in dangerous situations. 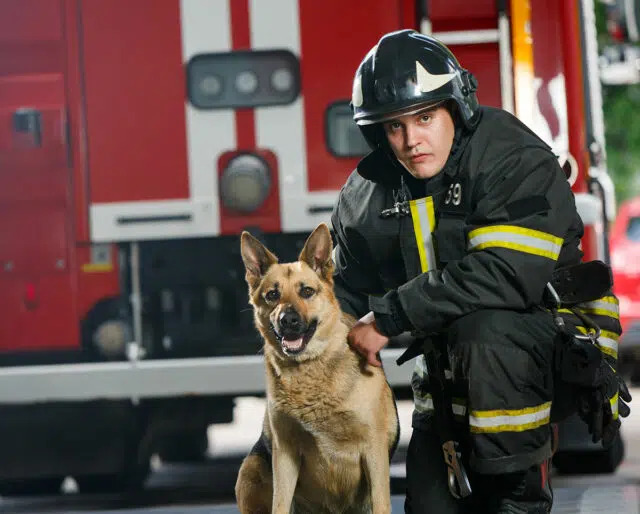 Fire pups are just as brave — and deserve to be recognized — just as much as dogs who have worked in wars, during natural disasters, or at crime scenes. Dogs have been bred to be loyal and loving. Fire dogs have the added responsibility of providing that loyalty to people who work in especially dangerous situations. Firefighting is a tough gig. Dogs provide a measure of companionship that helps keep our firefighters happy, content, and focused.